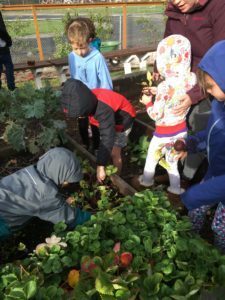 The garden has been a beloved classroom at Parkview Elementary since 2007. The current garden (moved in 2016) is tucked behind the school playground and was built thanks to the vision of the Parkview PTO. The fence is lined with espaliered apple trees. Additional fruits include plum, pear, kiwi and blueberries. A three-bin composting system has expanded the compost possibilities in the garden and various raised beds with permanent trellises allow for the cultivation of various vegetables and herbs. 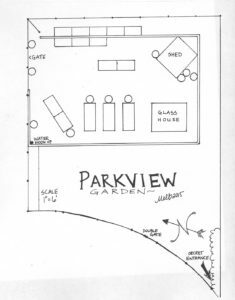 A small greenhouse allows for starting crops indoors and providing starts for not only Parkview’s own garden but also the wider school community. Parkview Elementary School garden has approximately 280 square feet of growing space. It is located at 3033 Coolidge Drive, Bellingham WA 98225-1803. Parkview Elementary School was the site of the 4th Annual Dirt Fest community-wide garden party ~ Here’s a photo album from our Parkview Garden Party!